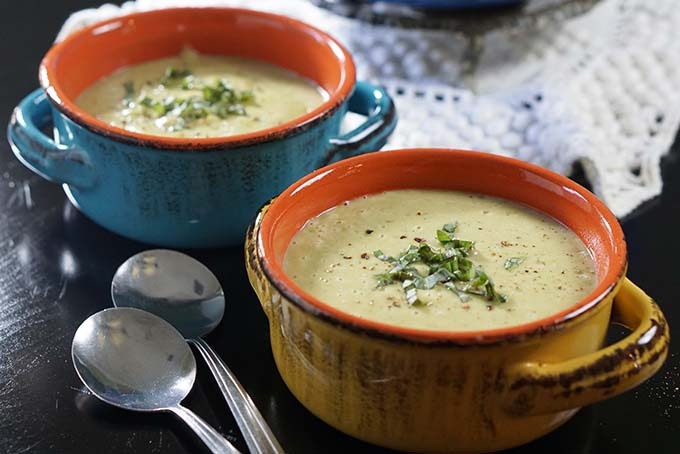 Cream of Zucchini Soup is creamy, silky and so flavorful, you would swear you’ve simmered this on the stove for hours – but instead, it only takes 30 minutes. 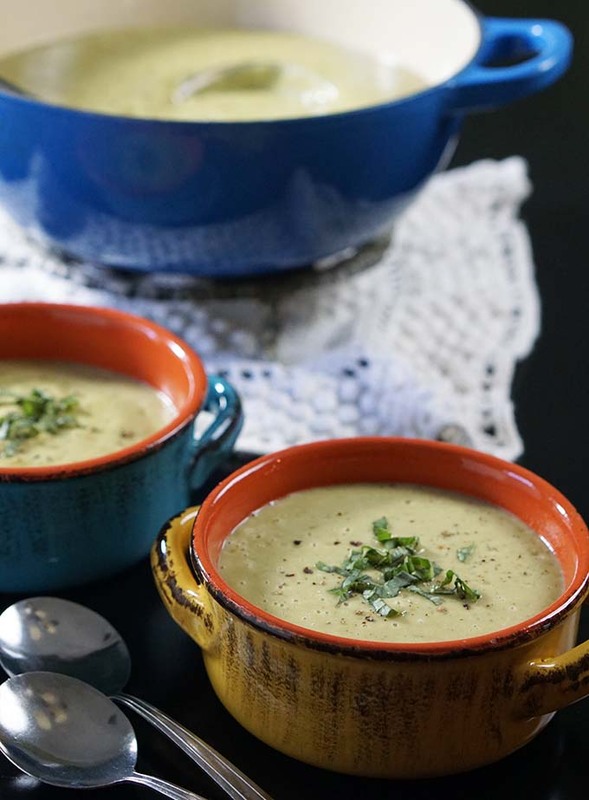 Creamy Zucchini and Parmesan Soup is guilt-free without any cream! Souper easy to make this soup is simple and flavorful! When we I was in the third grade, we moved out to the country to a little house out in Yankton where Dad had a little hobby farm. We had chicken, ducks, a goat and of course a garden! The garden was tilled in an area that had formerly been part of a corral. It was pretty big and we planted potatoes, corn, radishes, onions, tomatoes and zucchini. That year, and every year after, we reaped the harvest. Hard work in the spring always meant fresh vegetables all summer long and well into the fall! My brother and I helped in the garden and learned to love fresh veggies and simple delicious food. It was a perfect place to grow up! This soup is so creamy, but guilt free because there’s no cream! It always amazes me that after eating so many veggies I still love them today, but I do! Enjoying a great meal is definitely my thing and soup is my jam! What can I say? Soup is good food! This is a “souper” (get it super/souper?) easy 30-minute meal so it can be easily made when you get home from work – love that! Chop the vegetables, simmer and then blend the soup until silky and creamy. 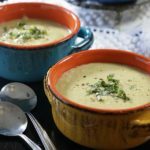 How do you make a creamy soup without cream? Using yukon gold potatoes will give you a creamy texture without the fat and calories! Start by chopping the vegetables and sauté them for about 5 minutes or so. When the potatoes are soft, everything goes into the blender. Whirl it up and you’re done. 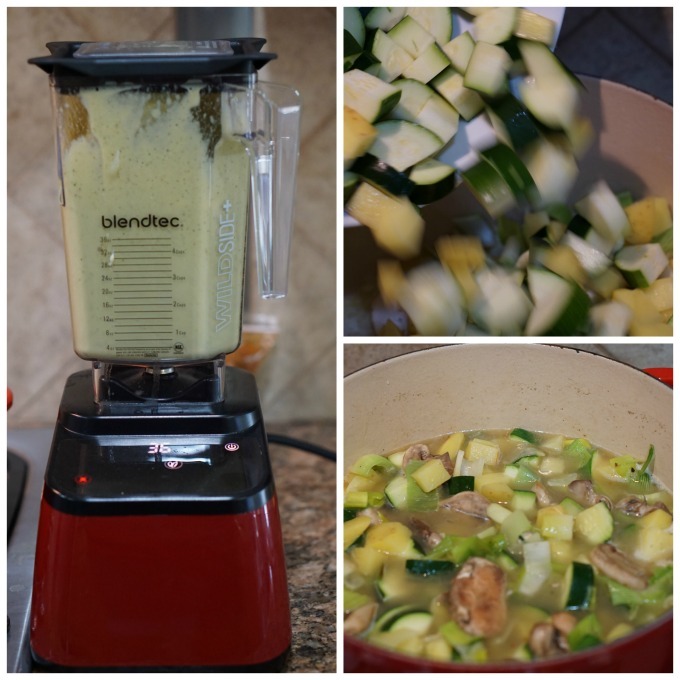 This Zucchini Soup Recipe is quick and easy to make and is completely delicious! Don’t use a packet of shredded cheese – purchase a wedge and shred your own. Don’t throw the parmesan rind away after grating the cheese. Wrap it well and toss it in the freezer. Next time you make Minestrone Soup, add it to the soup. It will give you a ton of added flavor! This is a great soup to make ahead and reheat, though it doesn’t freeze well. No need to peel the potatoes, just chop them up small and when you blend everything together it becomes silky and creamy without any cream. Click here for all of my tips and tricks to make the BEST Homemade Soup! This soup is easy and delicious – my kinda meal! More delicious creamy soup recipes that are quick and easy to make! 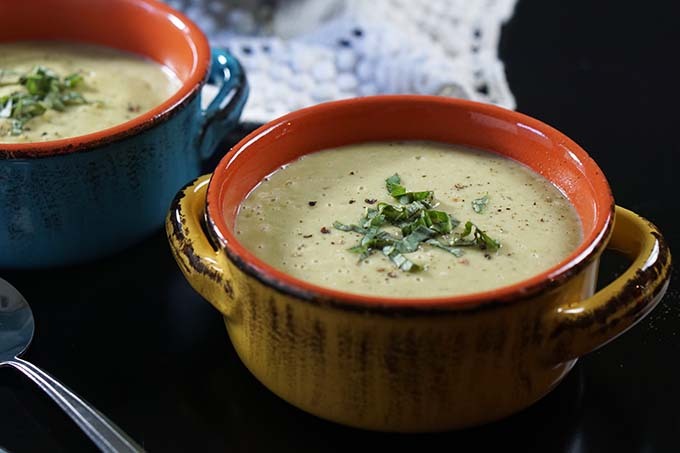 30 Minute Zucchini and Parmesan Soup is creamy, silky and so flavorful you would swear you've simmered this on the stove for hours but instead takes just minutes to make. No cream either - we love this soup! Slice the zucchini in half and slice into one-inch pieces. Chop the potatoes into small one-inch pieces - this will help them cook quickly and evenly. In a large stockpot over medium heat, add the butter & olive oil. Add in all of the vegetables and season with pepper & red pepper flakes. Sauté the veggies, stirring occasionally for about 5 minutes or until they just begin to soften. Add in about 3 cups of stock - just enough to cover the vegetables. Increase the heat to medium-high and bring to a boil. Continue to boil until the potatoes are fork tender, turn off the heat. Add the parmesan cheese and stir until melted. Ladle into a blender in batches or use an immersion blender and process until smooth and creamy. Taste to adjust the seasoning. It may need salt, but because the parmesan is quite salty perhaps not - just taste and add if needed. Top with shredded leaves of fresh basil if desired, enjoy! Often times dirt & grime hides between the layers in the leek, just make sure to rinse them well to remove it. Your recipes are just as delicious as they were . It is so nice to see you grow over the years. I love both your recipes and I can’t wait to try this recipe. Yum! It’s exciting and so rewarding to have such a great group of colleagues. Rini you rock! Thank you for all that you do! I need a better blender so that I could try to make this recipe…it looks delicious! I have to say, I do love my blender Janelle! Though you can also whirl it up in your food processor or use a submersion blender. 😀 Enjoy!! Zucchini and parmesan make this soup probably an absolute winner! I could go for a bowl of this deliciousness right now! You would just love it (if I may say so myself!) it’s so savory and delicious! Thank you Ilka!! This sounds amazing! I love soup, and right now I’m trying to get my husband to eat more veggies! I think this will work well! Yes! Great way to sneak in some veggies without him knowing! 😉 Such a delicious soup! I love those colorful bowls you serve this soup in. The pictures are really nice, and they make me want to dip a spoon in! This is so savory and delicious, thanks Sandi!